For every friction combination, electrostatic charges can arise which can cause unwanted sparks to lash over to the components concerned. This mainly afects electrically insulating materials, such as plastics. If systems are subject to regulations such as the ATEX Directive on explosion protection, it must be ensured that no risks are created through electrostatic charging. The structure of KS PERMAGLIDE® plain bearings is comprised of metals and plastics, so-called metal-plastic composites. Metals are typically electrical conductors, whilst unilled plastics are insulators. The running-in layer of KS PERMAGLIDE® P1 materials basically consists of the insulating plastic PTFE (polytetraluoroethylene) with anti-friction additives which serve as a solid lubricant. 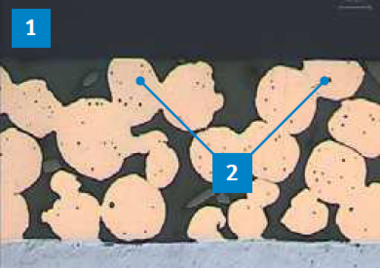 The composite material then only becomes conductive (ELS*), when the running-in layer has been removed (material removal of between 0.005 mm and 0.030 mm) and there is contact between the surfaces of the metallic interacting sliding partner and the functioning sintered bronze layer. This is generally the case after a short running-in phase. For static applications or for micro movements, it cannot always be presumed that the run-in process has been completed. The conductivity also depends on the speciic compression. In the initial state of the plain bearing, higher surface resistances must therefore be expected. KS PERMAGLIDE® P1 materials can fundamentally be classiied in the group of anti-static materials (ESD) (electrical surface resistance < 1012 Ω). 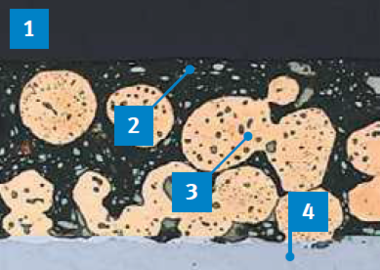 Following the run-in of a KS PERMAGLIDE® plain bearing, metallic frictional contact is generally created with the bronze layer so that the surface resistance is moved into the range of megaohms (106 Ω) up to kiloohms (103 Ω), and becomes electrically conductive or electrically conducting. Due to the elemental lead in the solid lubricant, the KS PERMAGLIDE® P10 and P11 materials tend to have better electrical conductivity than the unleaded KS PERMAGLIDE® materials such as P14. The KS PERMAGLIDE® P2 materials do not provide any electrically conducting characteristics. Due to the structure, the metals in the material are shielded from the interacting sliding partner by a thick polymer sliding layer. KS PERMAGLIDE® P2 materials are therefore insulators (electrical surface resistance > 1012 Ω). Even the components containing lead in the plastic or the amount of carbon ibres in unleaded KS PERMAGLIDE® P20x materials do not provide a suiciently conducting compound to create antistatic characteristics. 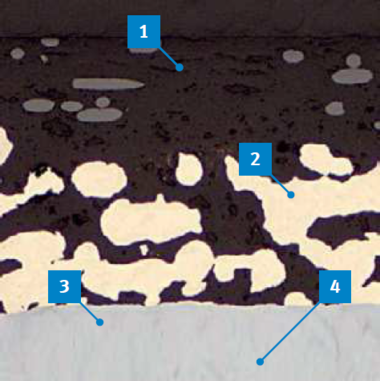 Low-maintenance KS PERMAGLIDE® P2 materials are also mainly used when lubricated, which increases the insulating efect.